The tiger mosquito has been making its way to our regions for some time now. Image 1/1 : Dr. Isra Deblauwe is investigating a potential breeding spot of the tiger mosquito. Last summer, tiger mosquitoes were spotted in five different locations in Belgium. It is remarkable that this mosquito now travels to our country overland from neighbouring countries. The tiger mosquito or Aedes albopictus has been making its way to our regions for some time now. ITM researchers and their partners are monitoring this and other exotic mosquito species at 23 risk locations that are likely first points of entry into Belgium. The last time a tiger mosquito was observed in Belgium was in 2016. From May to September 2018, scientists from ITM identified tiger mosquitoes at five locations in four provinces: East Flanders, Hainaut, Namur and Luxembourg. They trapped 68 tiger mosquitoes at different stages of development (24 adult mosquitoes, 8 larvae and 36 eggs) in the Waasland harbor, which seems to indicate that the mosquitoes had a chance to propagate this summer. In the other provinces only a limited number of adult mosquitoes or their eggs were discovered. In Luxembourg and Namur, eggs were detected in parking areas along the motorway, which may indicate that the tiger mosquito made its way by car from areas in France or Germany, where the species is prevalent. It is the first time the tiger mosquito has travelled to Belgium overland from a neighbouring country. 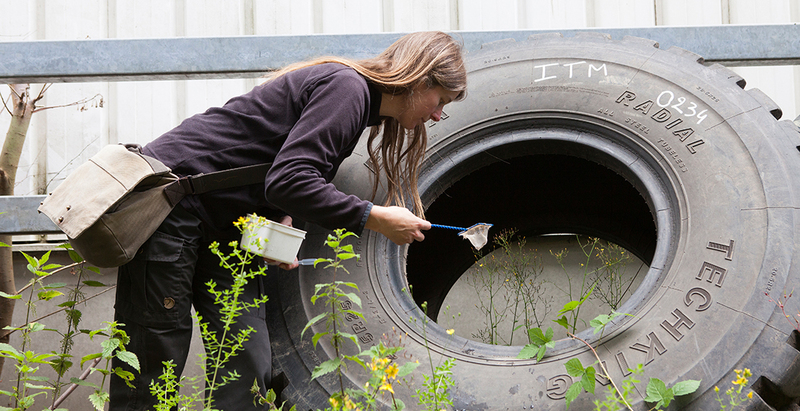 The mosquito was last seen in 2016, when ITM researchers spotted it in second-hand tire companies, garden centres and the port of Antwerp. In those cases, the mosquitoes migrated from far way places via the shipped goods. "The tiger mosquito may gain a foothold in Belgium. It now crosses the border into our country from neighbouring countries where it is already established. We must closely monitor their spread to prevent the species from permanently settling here so a control programme can be set up as quickly as possible. We have also detected more mosquitoes, because we monitor more intensively in Belgium," explained Dr Isra Deblauwe, who is in charge of the MEMO project’s day-to-day coordination. In addition to the Asian tiger mosquito, three other exotic mosquito species were spotted last year, including Aedes japonicus and Aedes koreicus. The Asian forest mosquito or Aedes japonicus was once again found in Namur and near the German border. Aedes koreicus had already been identified in Belgium in 2008 and has settled in the Maasmechelen area. ITM researchers closely monitor these small mosquito populations and their spread. So far, the species has not yet caused a nuisance. "It is crucial to continue this structural monitoring because locating these exotic mosquitoes early on enables effective control and helps defer their establishment in our country as long as possible. Even if the mosquitoes were able to settle here, careful surveillance of these populations is a must in order to assess the risk of disease transmission, " said Dr Wim Van Bortel, general coordinator of the MEMO project. The MEMO project, short for 'Monitoring exotic mosquitoes in Belgium', is a three-year project (2017 - 2020), financed by the Flemish, Walloon and Brussels governments and the Federal Public Service Health, Food Chain Safety and Environment in the context of the National Environment and Health action plan (NEHAP). ITM carries out the project in collaboration with the Royal Belgian Institute of Natural Sciences (RBINS), and Barcoding Facility of Organisms and Tissues of Policy Concern (BopCo). With support from Avia-GIS, the VECMAP information system is used to integrate field and laboratory data. Flemish, Walloon and Brussels authorities are immediately informed each time tiger mosquitoes are detected so that control measures can quickly be initiated. ITM has been carrying out surveillance of exotic mosquitoes at various locations in Belgium for many years. The Institute has expanded these activities since July 2017 and doubled the number of locations investigated by the MEMO project. As a result of these years of monitoring, ITM researchers have built up a unique expertise and dataset, which accurately maps the first introductions of exotic mosquitoes in our country. Is the tiger mosquito dangerous? The Asian tiger mosquito or Aedes albopictus is a small black-and-white striped mosquito. Not only has it a painful bite, it can also transmit viral diseases including dengue and chikungunya. The presence of a few tiger and other exotic mosquitoes in Belgium does not necessarily mean that we are in for virus outbreaks, as the mosquitoes themselves do not present any danger. To transmit a virus from one person to another, the mosquito must first bite a person infected with the virus. Only then can it transmit this virus to another person. To enable transmission, the virus and the exotic species must be present at the same location at the same time. The chance of this happening increases if both the population density of the mosquito species and the number of locations where it occurs increase.